Ex-radio disk jockey turned pro restaurant magician in Connecticut. 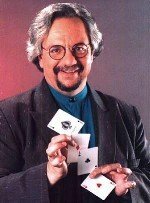 Jim Sisti has been performing magic for over 25 years. A prolific writer and inventor, his books on magic and magic effects are marketed all over the world. He is also the publisher of The Magic Menu . The cards certainly appear ordinary...but your audience will be rubbing its eyes as four bicycle-riding Kings disappear right off the faces of four Jokers one at a time and reappear on the faces of previously blank cards. It even happens when a spectator places their finger on one of the blank cards! Tips and tricks for the professional and aspiring restaurant magician. Ecco una semplice ed efficace routine di coltellini che cambiano colore creata da Jim Sisti che ci presenta la routine in questione arricchita da una gustosa presentazione che prende spunto dalle sue origini italiane: Jim infatti, dopo aver dimenticato il suo set di coltellini in un cassetto per anni (a detta sua, non trovava una presentazione adeguata per la sua routine), decise di riprendere a lavorarci, dopo una reunion di famiglia in cui vide tutti gli anziani di famiglia riunirsi a fine pasto per sbucciare la frutta con i propri coltellini tascabili! This is a compilation of all volumes 1-12. It covers the entire lifetime of The Magic Menu from the first issue to the last issues of volume 12. The magician claims to have taken a playing card from a completely different pack and reversed it in the deck placed in plain view. The spectator is then asked to merely think of any card. After the selection is made, the magician picks up the pack, removes it from its case, and spreads through the cards, displaying the spectator's choice as the only card face up. When it's removed from the pack, it's turned over to display a completely different back color, thus proving the magician's claim that it originated in a completely different pack. One of the things that I had to come to grips with when I became a full-time professional performer more than 20 years ago was that I needed to stop focusing on tricks that I liked and had to find ones that my spectators liked. I also decided to try and make my presentations less expositional ("Watch this coin…" kind of stuff) and more about personal expression – letting the audience get to know me perhaps a little bit better as a result of the magic. This is a compilation of volumes 6-10, issues 31 - 60. This is a compilation of volumes 1-5, issues 1 - 30. This is a compilation of issues 61 - 64. This is a compilation of issues 55 - 60. This is a compilation of issues 49 - 54. This is a compilation of issues 43 - 48. This is a compilation of issues 37 - 42. This is a compilation of issues 31 - 36. A Special Jay Sankey issue. This is a compilation of issues 25 - 30. This is a compilation of issues 19 - 24. This is a compilation of issues 13 - 18.